In 1985 Coca-Cola decided to not leave well enough alone. They weren't dominating the soft drink industry as they had once upon a time. So they decided to just throw some cash towards some chemists. The result was New Coke. To simplify the national reaction, it sucked. Well, actually that's a bit unfair. The reaction was favorable among some American pop drinkers, most notably...yankees. Why would people in NYC and Washington prefer the crappy knock-off to the awesome original? Well, probably because that's where Coca-Cola marketed the release of the new drink. They went all in up yonder and forgot the company's roots, the South. Atlanta. Ma and Pop. Soda fountains. "Where there's a Coke there's hospitality" is an old Coca-Cola slogan. But suddenly southerners weren't feeling too hospitable towards a revolutionized brand. Phone calls were made, literally thousands a day. Letters were written as if the company had committed the most heinous of acts. Lights came on again inside Coca-Cola headquarters and three months after New Coke took to the shelves, the original formula returned from the grave. 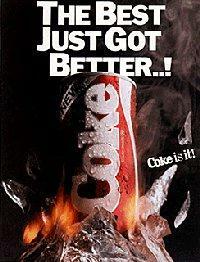 By Christmas Coke Classic was not only outselling New Coke, but also rival Pepsi as well. The moon re-entered the Earth's orbit. Birds sang from tree branches again. And babies' blankets were warm once more. Why do I bring this up this morning? Well...let's all welcome Missouri! !...to the SEC East!! Tyler's guide to all things Mizzou did little to settle my stomach. 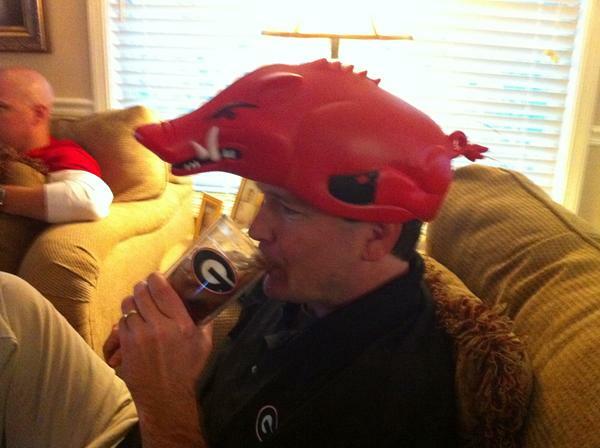 ecdawg looks at what this means for the SEC's recent dominance. Meanwhile, CCRider sums up most of my feeling son the subject. Over at the BlawgHouse, three simple words: Bring. On. Auburn. Don't look now, but according to the Senator's latest stat watch things are right on track. Harton won't usurp Crowell's status as the #1 tailback, but it does sound like he could be in the mix for top backup. Chris Low has his latest bowl predictions out. Penn State making Miami look like a model program? Sick bastards. Every single one of them, from JoePa all the way down to the vile molester himself. Big shout-out to Curtis Beall who was featured on the jumbotron Saturday as the oldest living male cheerleader. Here is a link to his book, Memoirs of a Marine Dawg. Lastly, another shout-out to Mike Moss for putting together the 1980Dawgs DVD signing at the Red Zone with Rex Robinson and Scott Woerner. It's not everyday a Dawg gets to meet a childhood hero. And I'm pleased to pass along that Rex says he and Scott were able to bury the hatchet over the "Everyone hates kickers" comment. If you have seen the documentary and/or follow Rex on Twitter that'll make sense. Saturday was a great day. Got to take the family to Athens, the kids rang the Chapel Bell for the first time and everything else went about as I hoped and predicted Saturday night. Thank you Hogs! Unlike a drink that gets diluted as the ice melts towards the end, this season may have been diluted on the front end. But Coach Richt's team has stayed the course and slurped right through the unsavory beginnings. There is much work left to accomplish, but the winning formula is still there. Play hard. Finish strong. Win. If everything goes accordingly, I'll give Heath his head gear back in Atlanta. Have a great Monday Reader. Fortify yourself on some forkloads of this meatloaf. There is much hate on this week's agenda.